The hot weather is firmly entrenched in Mendocino county and the gardens have been popping! Between our backyard garden and the community garden plot we share with our friend Susan, we have been awash in blackberries, tomatoes, zucchini, and most prolifically, cucumbers. SO MANY CUCUMBERS. The first round of peppers are almost ready to be harvested and the eggplant and beans are flowering like mad. We have a little pumpkin that struggled at first but tripled in size in a week (maybe because now it’s getting water – go figure). These blackberries are a double whammy of delight, being both thornless and ginormous. Plums are almost done but continue to ripen with a vengeance. Someone needs to tell the plum tree that it doesn’t need to produce *quite* so much fruit. The sidewalks are covered in rot, even from the trees that are being frequently harvested. 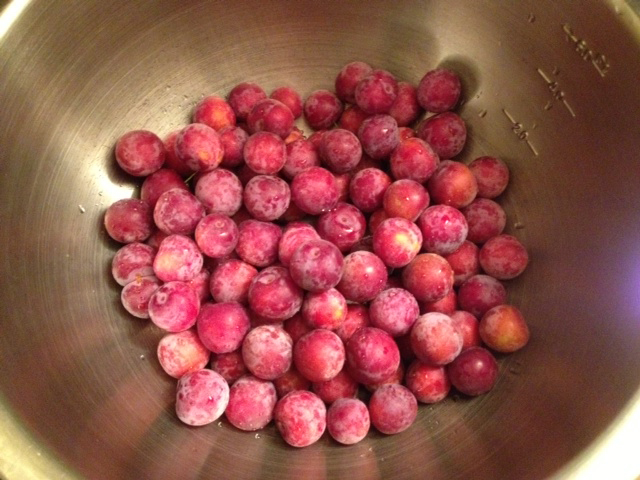 We’ve already done a round of picking, pitting, and canning plums, and I’m sort of plummed out in terms of processing. But I discovered an ingenious use for these tiny, fussy fruits: soak ’em in booze! I like to call it Plum Rum. I referenced my fruity booze obsession in an earlier post when I added rum-soaked strawberries to a cherry chutney I was making. Those strawberries were supposed to be the start of a summer rumpot, an idea I got from my friend Amber who makes it every year and gives out little jars of it for Christmas. I hoard my rumpot every time, so this year I decided to make one of my own. Of course, Amber is a much more patient person than I am. Rumpot is supposed to sit for MONTHS, with new fruit (plus more sugar and booze) added as it comes into season. However, after just one week of soaking some strawberries back in May, I tasted it and declared it delicious and, therefore, done. I strained out the fruit, and strawberry rum was enjoyed by all (and, on one occasion, enjoyed a little too much by Susan and me). With so many plums on hand I decided to give them a try. I smashed them ever so slightly, added significantly less sugar than I did to the strawberry rum (it was awesome but cloying), and let them sit for a week. VOILA – a light but lethal summer drink. A quart of it only lasted five days (to be fair, those days were over the long 4th of July weekend). 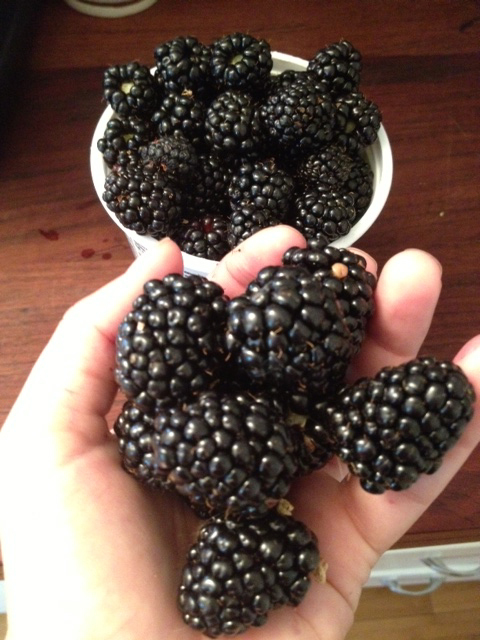 Right now I’m making another round, this time with the sunburned blackberries that weren’t good for eating. 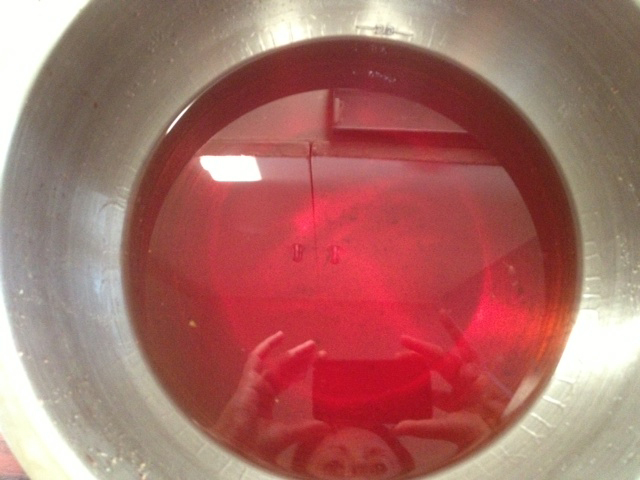 So if you’re in the neighborhood and in the mood for some blackberry plum rum, holler. It will be ready soon! Wash the fruit and chop or slightly mash it and put it into a large non-reactive bowl. (I don’t actually know what this means, and I think I’ve been using a reactive bowl if aluminum is reactive, but I feel compelled to warn you that other recipes encourage a non-reactive receptacle.) Add sugar – I use about a 4:1 fruit to sugar ratio. Add enough cheap rum or vodka to cover the fruit. (I cannot emphasize enough how little the quality of booze matters here – the fruit will cover that taste up.) Cover with a lid or plastic wrap and let sit in a cool, dark place for at least a week. Once you think it’s ready, drain off the fruit (feel free to use the boozy fruit in other recipes like a chutney, or eat it, or chuck it) and serve with aplomb. I like to add it to fizzy water for a refreshing cocktail.